These pins were sold by both the Armed Forces and countless other retail outlets for soldiers to give to their wives, girlfriends, and mothers to wear while they were deployed overseas. The decorations of each, of course, generally denote the branch of service or duties that were being performed by their loved one. These decorations are much more akin to jewelry than an actual medal, but their military connection is immediately obvious. ALL ITEMS 50% OFF IN THIS CATEGORY! his Sweetheart Pin features, apparently, a chrome finish. 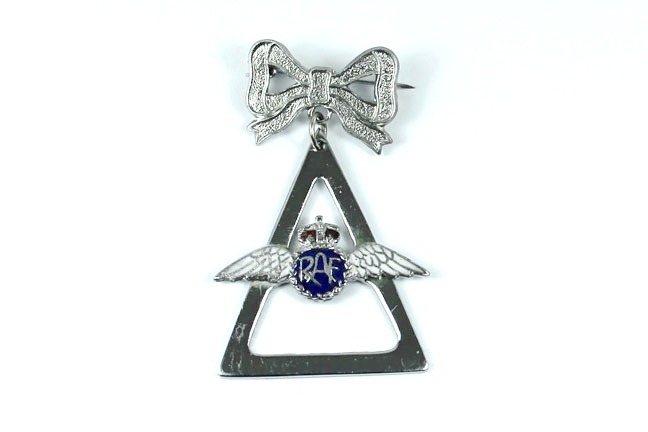 There is a bow at the top of the pin, and attached to this bow is a triangular figure which has the wings of the RAF across the center. 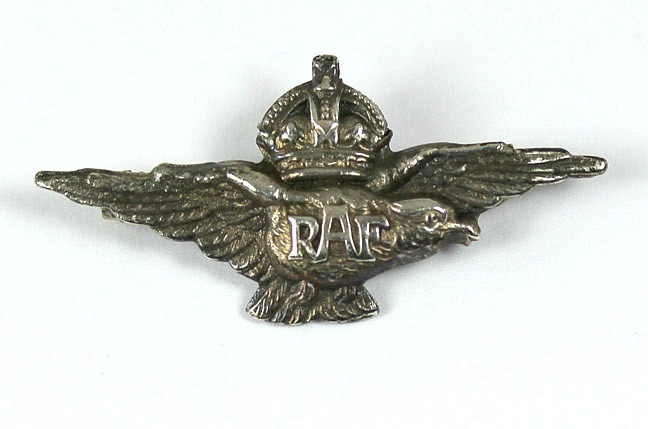 The wings are set with the usual crown and the top, as well as a blue insignia marked “RAF”. The piece is unmarked on the reverse, and is equipped with the usual hinged pin and catch. 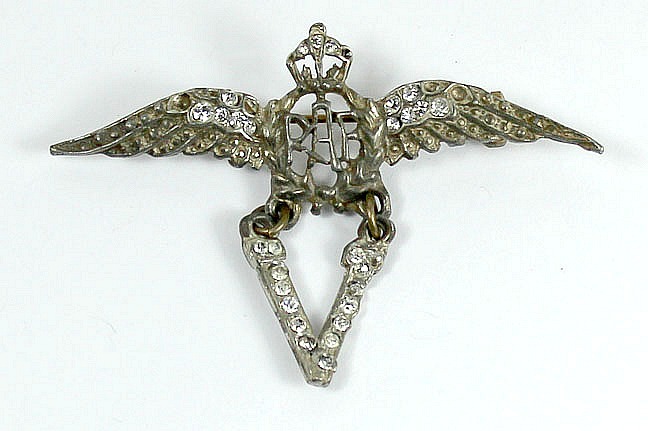 This Sweetheart Pin has a coppery finish, and features a bow at the top with a set of British wings suspended beneath. The wings feature blue backgrounds, and there is a red enamel crown at the top center. The initials of the RAF are in the center. This piece is not marked. This British Sweetheart Pin has a coppery color bow at the top. Suspended from this bow is a cannon. Above the cannon is the British crown with red highlights, as well as ribboned Latin slogans above and below. This medallion-like pin is about the size of a fifty cent piece. It features a mother of pearl style background with the insignia of the British artillery, bring a cannon with a crown set atop it. The crown is highlighted in red, and below it is a blue ribbon with a Latin motto. The pin is a two-piece affair, with the back area being a separate piece inserted into the reverse borders of the front. Unsurprisingly there is a hinged pin and catch on the reverse; you wouldn't put the pin on the front after all. This Sweetheart Bow is all in silver, and, suspended from it, is a silver framed blue enamel plaque. Applied to the plaque is the Seabee Bee (say THAT three times fast) insignia, complete with a Tommy Gun, wrench, and hammer! A great looking insignia here with a simply fantastic logo. The reverse of the piece is stamped “Sterling”. There is a long hinged pin and catch attached. A perfect gift for a "Can Do!" sort of lady. 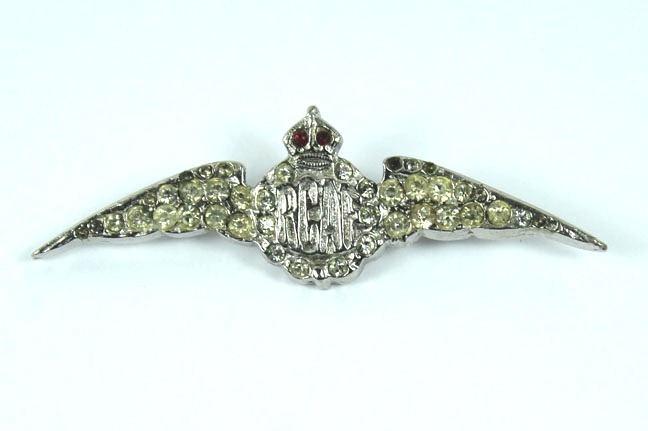 This set of Canadian Sweetheart wings is nicely detailed, with a crown at the top. In the center is the initials for the organization, “RCA”. The reverse is not marked, and has a hinged pin and catch. This set of British Sweetheart Wings is of extremely high quality. It features a crown set atop an eagle which is flying to the viewer's right. The eagle has the monogram, “RAF”, on his breast. The reverse of the bird is marked “925” as well as “Sterling”. A very nice, well made pin here, perfect for nice, well made lady. This set of wings has a nice finish and excellent detail throughout the wing feathering. 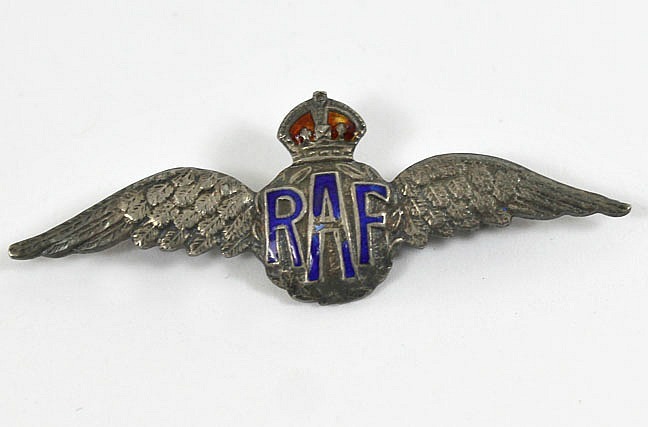 It bears a red enamel crown, over the initials, “RAF”, in blue enamel. 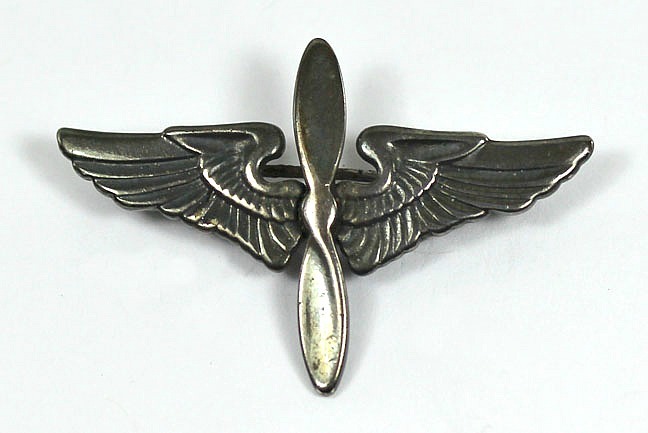 The reverse of this set of wings is marked “Silver”. There is a long, hinged pin and catch affixed. 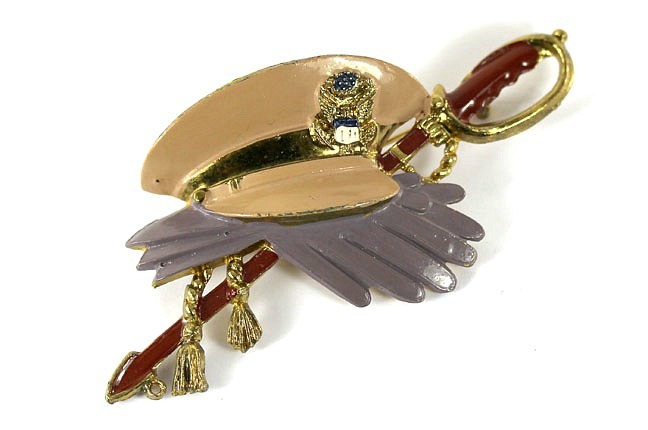 This very large Sweetheart Pin has a gold base depicting a tan officer's cap, with gold insignia, set in place over a pair of dress gloves and a sword. The reverse of the pin is marked “LN/25”. Attached to the rear is a long hinged pin and a catch. This large Sweetheart Eagle Pin is in the form, as the name would imply, an eagle, which is depicted in flight. Attached to the bird at his right is a set of flat jewels; red and blue, the third being missing but most likely white or clear. 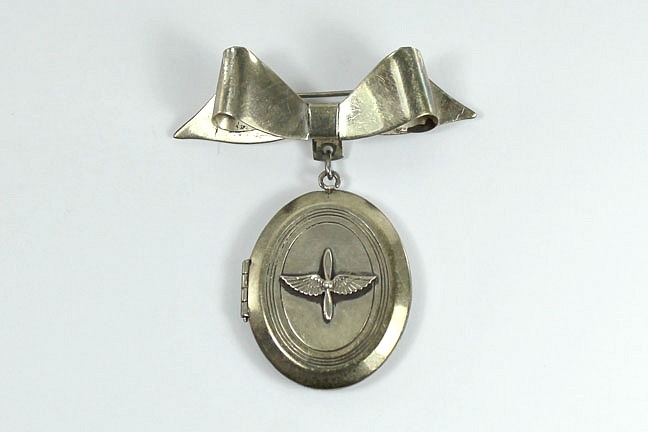 Attached to the eagle is a round pendant that depicts a set of wings, being the style with a propeller in the center. The wings are set on a gray base. Surrounding the pendant are many rhinestones, all individually set. The pin is unmarked on the reverse. There is a long hinged straight pin and a catch attached. This set of Sweetheart Wings has a completely gilded finish. The wings are very well detailed, with the American bars in the center. 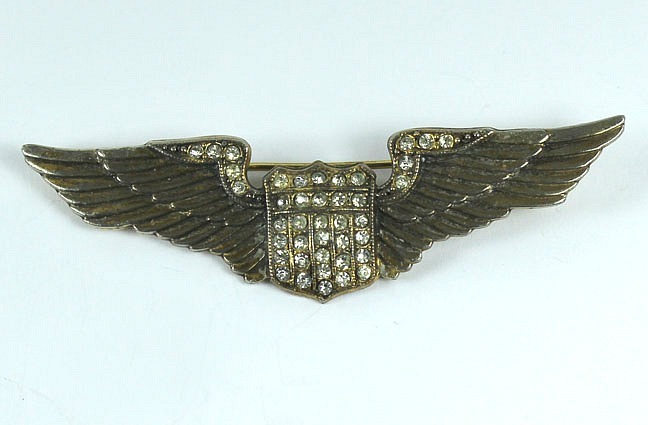 The tops of the wings are accented with rhinestones, as is the upper portion of the American bars. The reverse of the pin is stamped “Sterling”. There is the usual long hinged pin and catch affixed. A very nice item here. This set of Sweetheart Wings is quite large, having fine detail to the feathering. The tops of the wings are all decorated with fine rhinestones. The center are depicts a round medallion with red, white and blue with a aircraft in the middle. The reverse of the pin is marked “Sterling” as well as with the maker name “Cora”. There is a long straight hinged pin and catch affixed. This set of British Sweetheart Wings is quite intricate and very beautiful. It is the British type, having open wings with a crown in the center, set above a RAF monogram. The wings are completely set along the feathering with rhinestones. It is quite a complicated affair, and very eye-catching. The reverse of the wings is marked “Sterling”. There is a large hinged pin and catch affixed to the wings. A very nice set of wings here. This grouping consists of five different Sweetheart Wings. 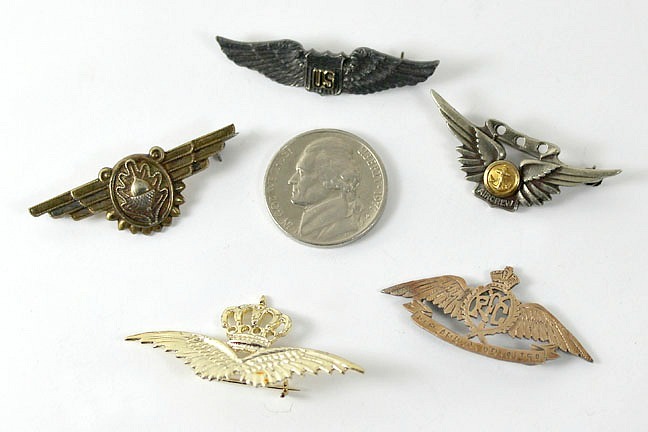 They consist of a US Aircrew example, US wings, RAF wings, some sort of British wings, as well as a set of wings with a charming little acorn. Kill all your sweetheart birds with one stone! Metaphorically, of course. This grouping of Sweetheart Wings consists of three different Canadian Air Force wings, as well as two United States Naval Air wings. These groupings are just perfect for the man with a busy rotation of women. This grouping of seven sets of American Sweetheart Wings vary in size and style. This grouping a real grab bag, but they are all of decent quality and good looking. If the same can be said about your sweetheart then maybe she deserves a pile of pins. This stubby little single engine plane looks, to me, like some species of trainer. It is nicely gilded, and has a some intricate detailing to the cockpit area. In each wing is set a large, glittering rhinestone. The stones are very beautiful, having wonderful cuts and lots of fire to them. There is a hinged pin and catch affixed to the reverse of this little plane. A great looking pin here! I'm going to date myself here, but this airplane looks like ancient Constellation to me. It has a red fuselage and sports four engines on the wings. The top of the wing surface is totally covered in rhinestones, as is the tail of the plane. There are also rhinestones in each of the windows. The pin is unmarked on the reverse, and has, as you can probably guess, a large hinged pin and catch. A very fine, jazzy pin here. It refuses to be ignored. 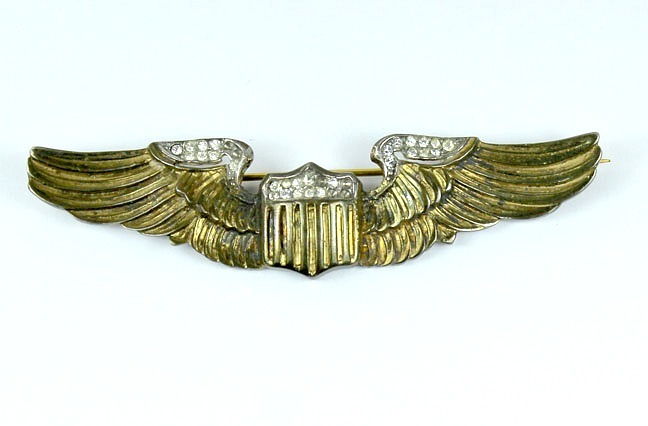 This set of Sweetheart wings features, as one might guess, a set of wings with a crossed propeller in the center. The wings are heavily slathered with rhinestones. The reverse of the wings is stamped “Sterling”. Affixed to the reverse is a hinged pin and catch. This set of Sweetheart wings features (naturally) a set of wings (naturally) with a crossed propeller in the center. The wings are richly sprinkled with rhinestones. Both parts of this larger assembly are marked “Sterling”. The locket, as one might expect, opens, and has a good hinge and firm catch. The face of the locket has an applied set of wings with a propeller in the center. The locket opens to reveal two oval spaces for photographs. 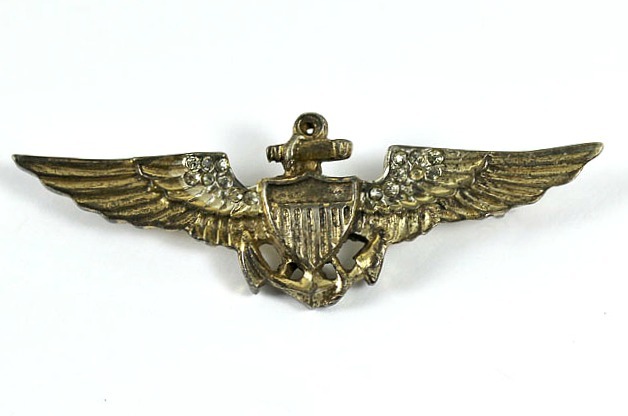 This set of Naval Sweetheart Wings has a gilded finish, and is unmarked. It is fashioned in the shape of a set of wings, decorated with rhinestones on the upper portions. In the center is an American crest superimposed over an anchor. The reverse is equipped with a long straight pin with a hinge and catch. 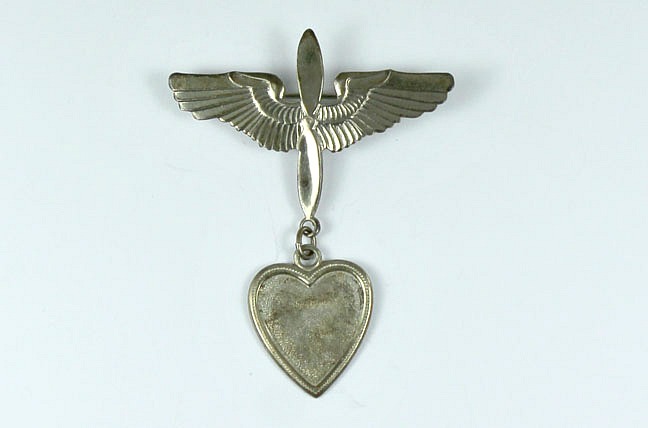 This very simple set of Sweetheart Wings has no extra adornment, and is marked “Sterling”. Most likely this is a base model for the GI on a budget, and perfect for fighting man with a very long roster of sweethearts. The reverse of theses wings is equipped with the usual hinged pin and catch affair. This medallion has a border in the form of a pierced silver wreath. In the center is an oval made of some sort of plastic, set against a pattern of sun rays. In the obverse center is an applied set of wings, being the type with a propeller in the center. There is a small loop at the top for attachment to a chain. The reverse of the wreath is marked “Sterling”. This eagle has a very wide wingspan, and a great look about his avian physiognomy. Suspended from his talons is a Naval seal set in celluloid. The seal is bordered entire with a sunburst pattern. The piece is marked “Sterling” on the reverse, and also has the initials, jeweler engraved, of the original recipient, “MMK”. There is the usual long pin, hinge with a good catch. 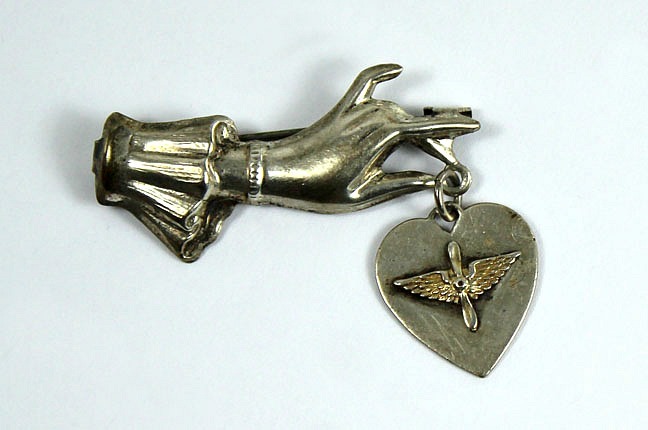 This set of Sweetheart Wings is fairly small, set with a propeller in the center and a chain attached. At the end of the chain is a crest, having pierced swords and a border of rhinestones. 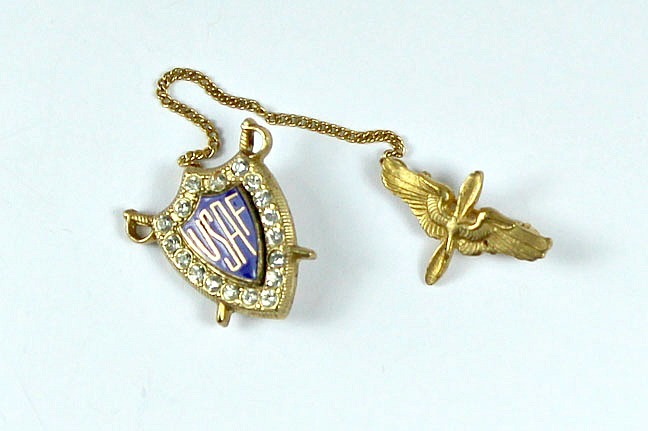 In the center is a blue shield with the initials “USAF”. This piece is unmarked on the reverse. This gilded Sweetheart Eagle has his wings tilted upward, with a silver “V” decorated with rhinestones between his wings. The bird clutches an American seal similarly bedecked with rhinestones. The shield is in a contrasting silver color. The reverse of the bird is marked “Sterling”, and has a hinged pin and catch closure. 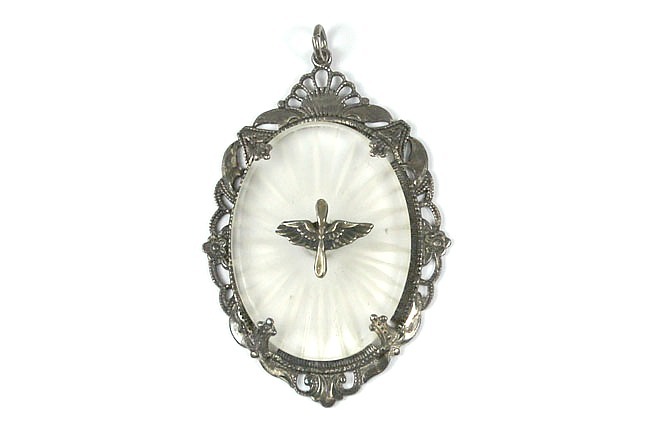 These Canadian Sweetheart Wings have highly detailed feathering, and an opening in the the center with a “V” shaped fitting containing a droplet. The droplet features a British Crown over a wreath. 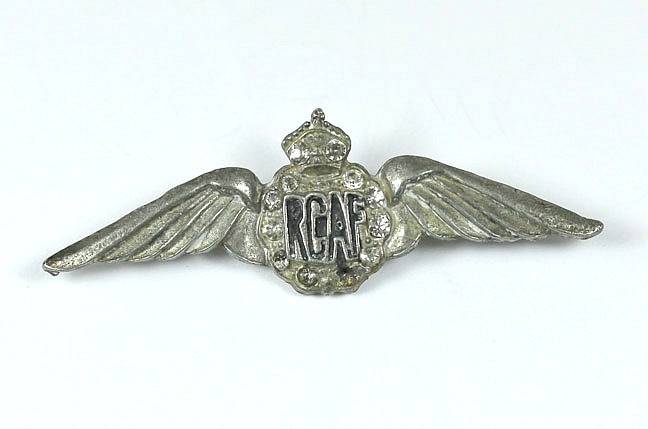 In the center are the initials of the Royal Canadian Air Force, “RCAF”. The initials are raised out. This piece is marked “Sterling” on the reverse, and has a large hinged pin and catch. 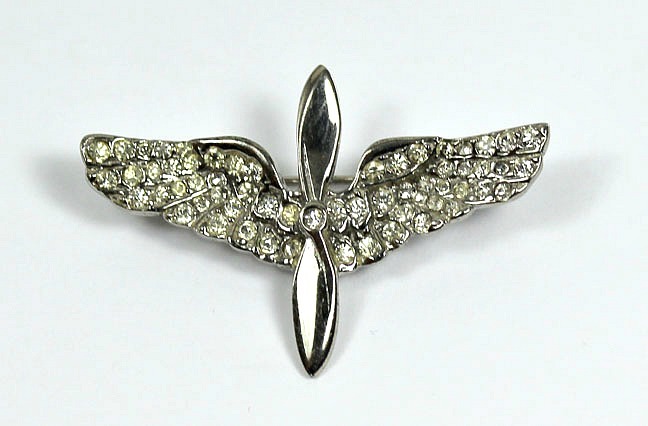 This set of Canadian Sweetheart Wings is a smaller size, and the total area of both wings is covered with rhinestones. IN the center is a wreath with a crown set atop it, and the initials of the Royal Canadian Air Force, “RCAF”. The reverse of these wings are unmarked. Affixed to the reverse is a straight hinged pin and catch. This set of Canadian Sweetheart Wings is the smaller variety. they have a silver finish throughout, but is unmarked on the reverse. The wings feature a pair of wings with a royal crown at the top. In the center is a wreath, set with rhinestones that run around the entire border. Inside the wreath are the initials of the Royal Canadian Air Force, “RCAF”. 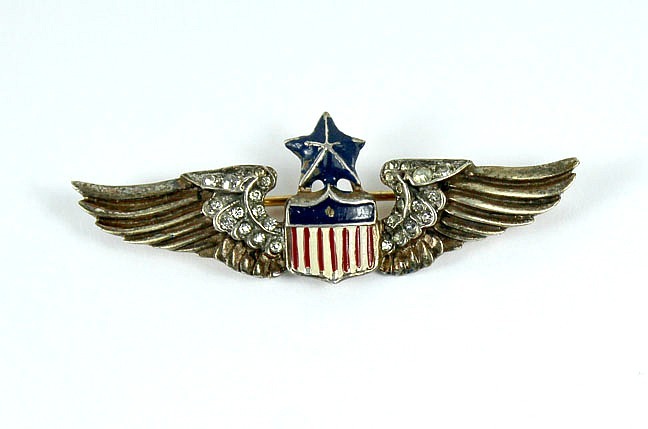 This set of wings has a silvery finish, and, in the center, the US crest is completed finished with rhinestones. The right wing has the top area set with faceted blue stones, while the corresponding area on the left wing is done up with red stones. The reverse of the pin is not marked, and has a long, hinged stickpin with a catch. This is probably a WW2 era piece. This set of Sweetheart Wings is finished in a copper color. The wings enclosed a United Stated flag crest; atop this crest sits a silver star. The tops of each wing is done up in rhinestones. The reverse of the pin is marked with the maker, “Trifari”, and is equipped with a hinged pin and a catch. 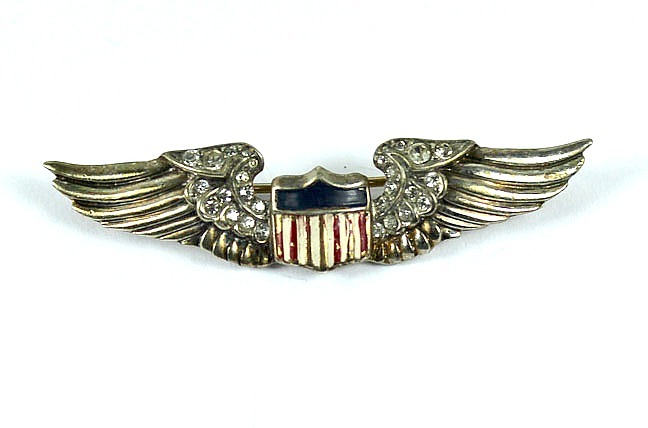 This set of Sweetheart Wings bears a shield decorated with the flag of the United States in the center, and each wing is decorated with bright rhinestones. The reverse of the pin bears the maker name, “Trifari”, as well as “Sterling”. It has a standard hinged pin and catch, in good working order. 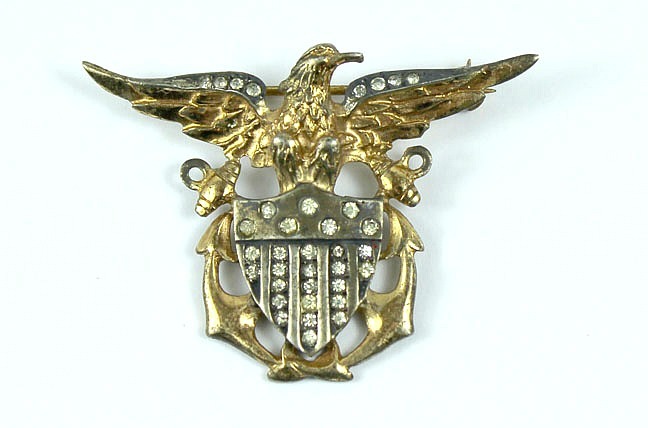 This jeweled pin is in the shape of an open-winged eagle positioned over a US crest, which is superimposed over an pair of crossed anchors. The upper sections of each wing as well as the crest are set with good quality rhinestones. A very nice Naval example here. This is the traditional American Eagle, with a crest set in the breast and a ribbon bearing the phrase “E Pluribus Unum”, which was the de facto national motto of the US until 1956, when a combination of overwrought religious and anticommunist hysteria prompted the change to “In God We Trust”. 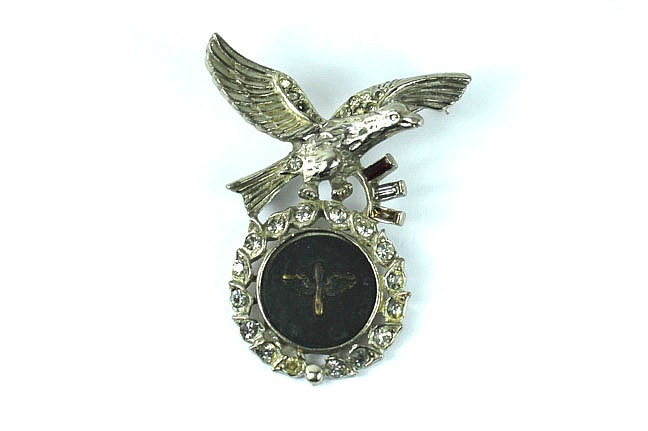 This beautiful eagle is set with small rhinestones, and is marked “Sterling” on the reverse. This is a very attractive and high quality pin. 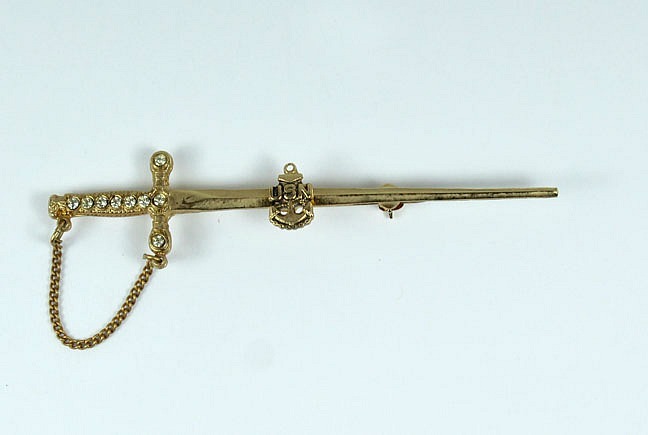 This beautiful Naval Sword Pin has a fine gilded finish. There is a US Navy anchor applied to the blade of the sword. The hilt has a chain hanger that runs from the pommel to the crossguard end. The grip and guard are finely decorated with good quality rhinestones. The reverse of the pin is equipped with a long hinged pin and a sturdy catch. This fine set of Silver Sweetheart Wings feature a US crest in the center, and have a fine patination. The upper areas of the wings are set with rhinestones, as is the upper portions of the crest. Unusually, this particular pin is quite heavy. The reverse of the pin is marked “Sterling”, and has a long, hinged pin and catch. 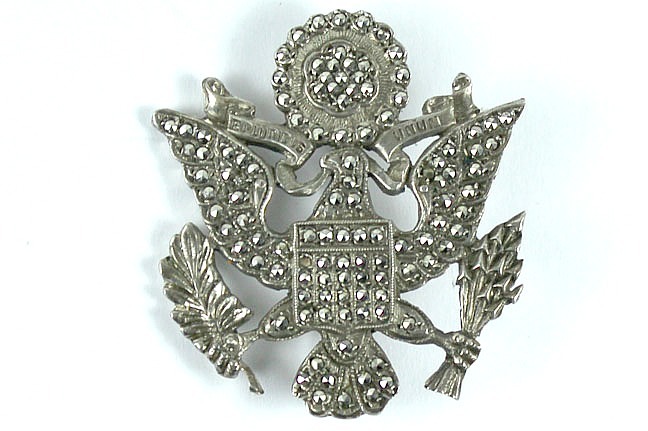 This Sweetheart Pin appears to be silver but it is not marked on the reverse. As the name would imply it is in the shape of a blimp, centered over a set of wings. 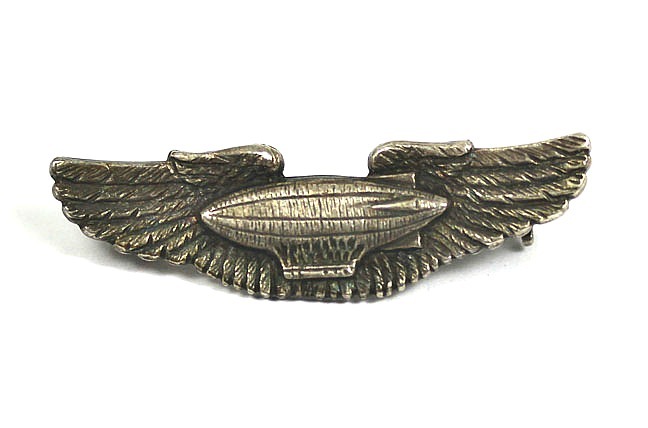 I would imagine that a pin associated with the Airship Corp should be quite rare. This pin would have also been appropriate if your sweetheart was a woman similar in size to a large gasbag. 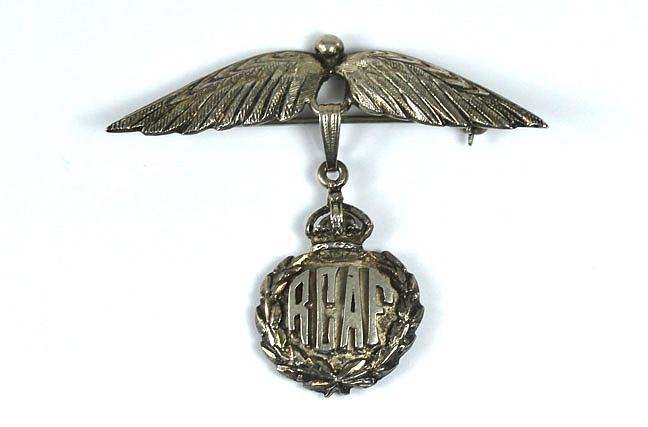 These wings are beautifully presented, with a pierced crown over the center area and bearing the initials “RAF”. The crown, wings, and “V” are all decorated with rhinestones. This pin is not marked on the reverse. It is equipped with a standard hinged pin and catch. A very attractive pin here. 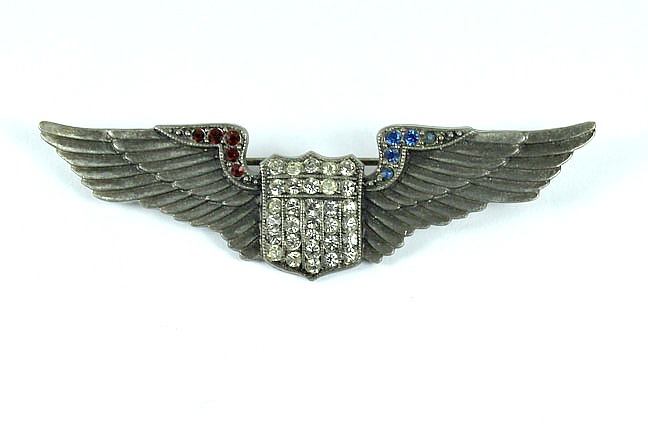 This half-wing Sweetheart Pin features a wreath on the left side with the initials “AG”. There is a sprinkling of rhinestones around the wreath. Attached to the wreath at the right is a half wing that is liberally doused with rhinestones. The piece is marked “Anthony” on the reverse, and has a standard hinged pin and catch. This Sweetheart Pin depicts the British Crown over a wreath with the initials, “AG”, inside. There is a wing protruding out to the left. The wing is nicely hand-enhanced throughout the feathering. The reverse of the pin is marked “Sterling” and is equipped with the usual hinged pin and catch closure. This set of American Sweetheart Wings has a fine, black patina throughout, as well as excellent detail to the feathering. In the center of the wings is a button bearing the American Eagle. 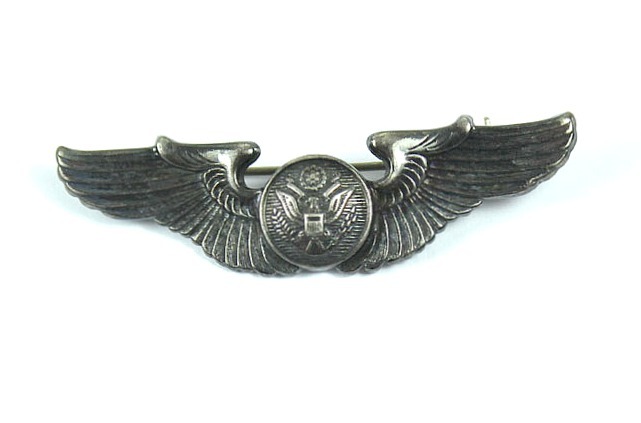 On the reverse these wings are stamped “Sterling” and there is a large hinged pin and catch closure. A nice example here. This set of Sweetheart Wings has a gilded finish over a silver base; they are marked “Sterling” on the reverse. The wings are the style with a propeller in the center. 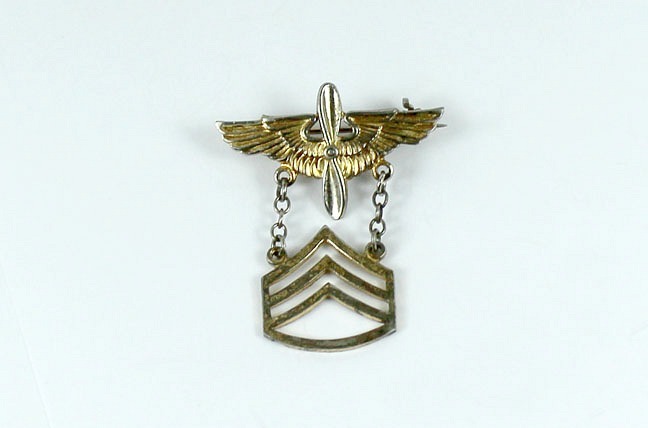 Attach to the bottom of both wings is chain to which is attached a pendant in the shape of Sergeant's rank stripes. This is an interesting set of wings that is rarely seen. 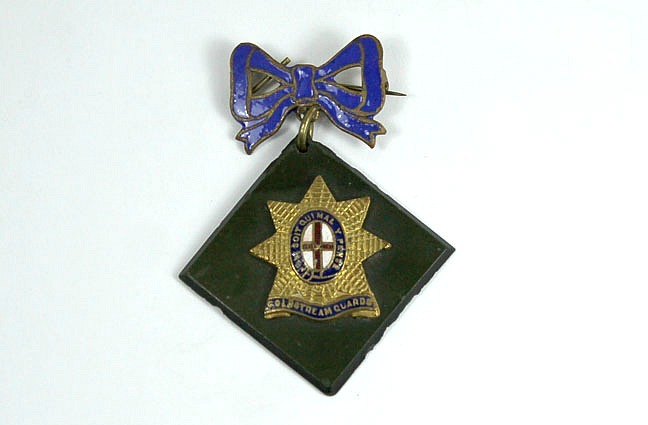 This pin consists of a blue enamel bow at the top, which has a suspended silver heart below it. The heart has a pierced border, with a center of silver and bearing a set of engraved RAF wings. The piece is unmarked on the reverse, and has a straight pin and fabricated hinge. 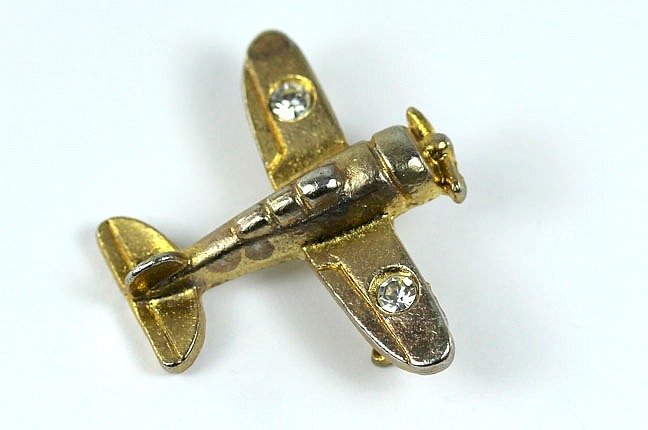 This pin is in the shape of a pair of open wings with a propeller in the center. Attached to the propeller is a suspended heart charm. The reverse of the heart is stamped “Sterling”. Attached to the rear is a long hinged pin and a sound catch. This bow and heart are all in silver, being stamped on the reverse “Sterling”. 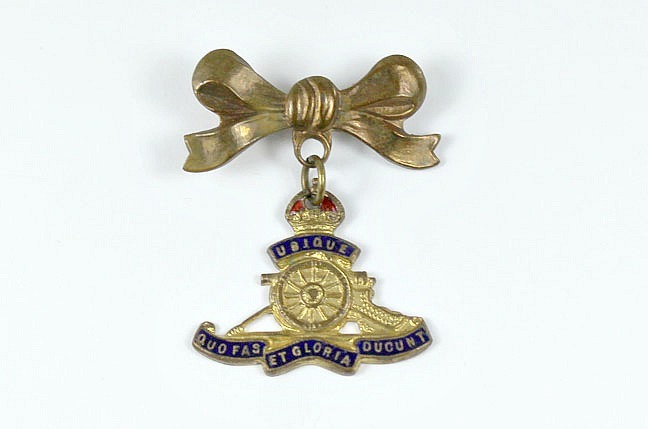 The bow has good detail, and the heart locket has the insignia of the RAF, in enamel, on the obverse. It features a crown over a flying bird, with ribbon at the bottom. The locket is hinged, as lockets are wont to be. I wasn't able to get it open with my gangly fingers; perhaps you can open it! If you're lucky perhaps there will be suitably naked Vargas girl inside, although you'll probably find a goggle-eyed Tommy. 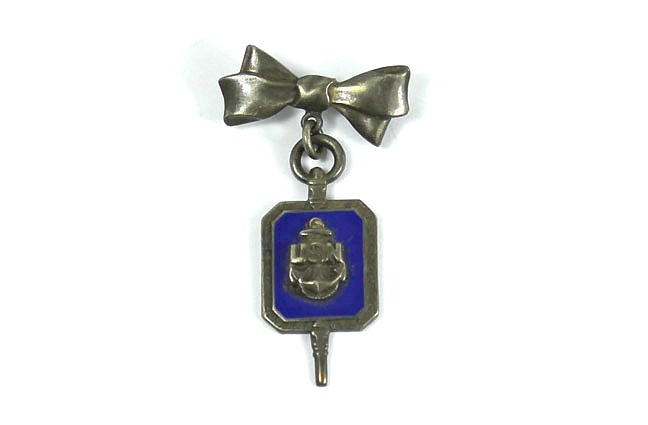 This silver bow has nice detail, and has a ringed suspension which holds a small plaque with a blue enamel background and an applied US Navy insignia. It is an anchor with the initials “USN” over the top. The bow has a standard pin/catch closure arrangement. A nice looking piece here. This silver pin is quite interesting. It is in the shape of a slender female arm with a graceful hand, complete with a frilly dress cuff and bracelet, holding a suspended silver heart. The heart has an applied insignia of open wings flanking a propeller. The heart is marked “Sterling” on the reverse, and the piece has a long hinged pin and catch. An unusual Sweetheart Pin here. This British Sweetheart example has an enameled bow at the top, with a ring which suspends a diamond shaped, green enamel (or Bakelite) charm. Applied to the charm is a gilded British insignia; a red enamel cross set against a border of red enamel. There are Latin slogans around the cross as well as at the bottom of this star-shaped charm. The bow has a long pin and catch, but the catch is quite worn. This Lucky Horseshoe is a gilded piece, with blue enamel covering the shoe and a gold “Good Luck” at the center portion. 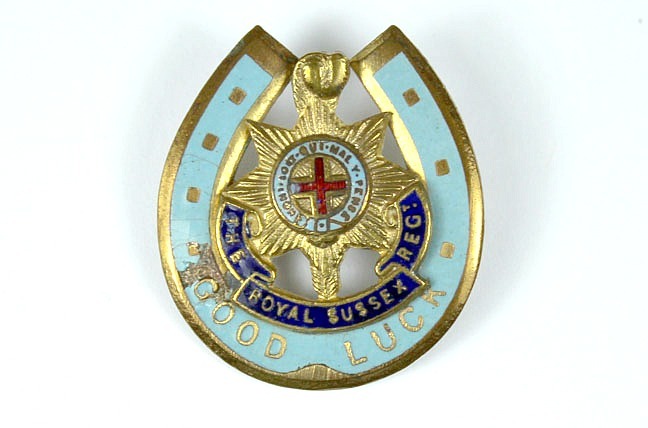 Inside of the show is a gilded British insignia, complete with the Latin slogans and a red cross in the center. The reverse has the usual hinged pin and catch affair.